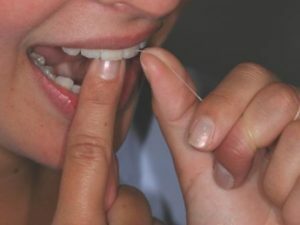 Flossing is important to remove bacteria from between the teeth that cause decay, gum disease, and bad breath. It should be part of eveybody’s nightime cleaning routine. Step 1. 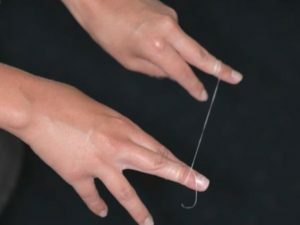 Wrap the floss around your middle finger on both hands so you don’t need to grip it. 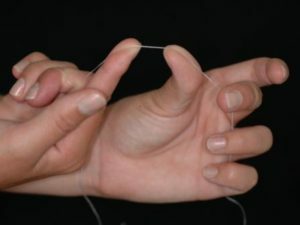 Then make a fist with the left hand and pull the floss back like a bow and arrow. Step 2. 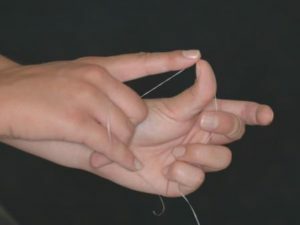 Reach out with your right index finger and touch the thumb – you may need to wrap the floss more so the hands are closs together. 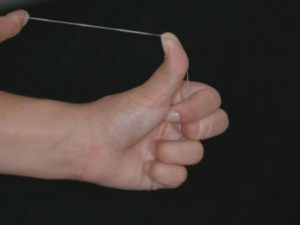 Then swivel the finger underneath as if you were going to point it down your throat to choke yourself. Step 3. 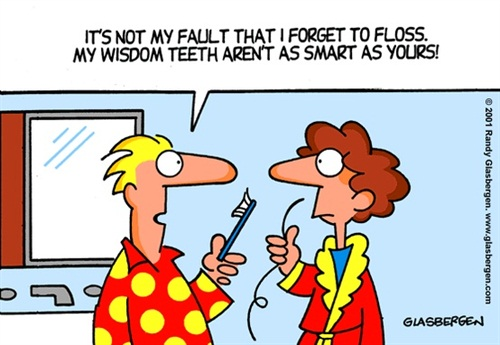 Floss up between your front teeth. 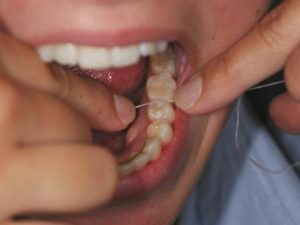 One tooth at a time, floss the upper left teeth – you may need to angle as you go towards the back and put your left thumb inside your cheek. When you have finished the left side, start from step 1 again but change the grips – right thumb / left forefinger. Step 4. For the lower teeth, use both forefingers and keep the thumbs well away. 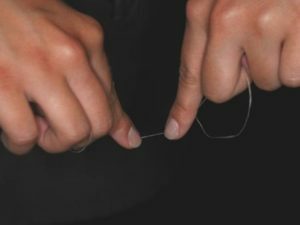 Aim to place the floss straight between the lower back teeth.